A medical alert bracelet can save your child's life. It is not a pleasant thought to consider, but we never know when a medical emergency will occur. If your child is involved in an accident or another medical emergency, you may not be present, or you may be unable to answer questions regarding your child's medical history. A simple medical alert bracelet can respond to these questions about your child's medical conditions when you are unable, saving valuable time, and ensuring they receive the proper emergency care. 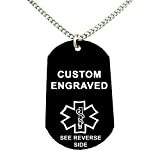 First responders in an emergency situation. Bright and fun colors allergy bracelets 7"
Best for heart disease, epilepsy, autism, diabetes, and more. Any age kid with a wrist size of 4.25" to 9"
Medical ID Wallet Card Incld. Save Money and Add Style! Come in four 4 colors. 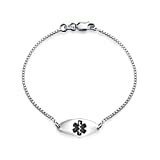 I had never considered the importance of medical alert bracelets until my daughter was recently diagnosed with diabetes. 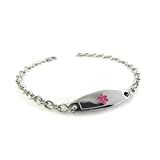 The doctor recommended that she wear a medical alert bracelet because her condition could affect the treatment she should receive in the case of an emergency. I hope neither you nor any of your loved ones ever find yourselves in any medical emergency. 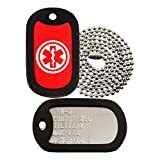 However, if your child has a chronic medical condition, allergies to medications, or severe food allergies having that information available on a medical alert bracelet can be invaluable in an emergency situation. So, who should wear a medical alert bracelet? If you or your child has been diagnosed with any of the following conditions you or they should be wearing a medical alert bracelet. This type of medical alert wristband is simple to use, unobtrusive and easily adjustable. The durable waterproof construction and secure Velcro closure can withstand the most rugged activity. 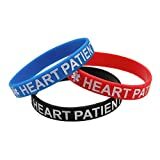 These medical alert bracelets do not require engraving, making it easy to update your child’s medical information as needed. Most of these adjustable medical alert bracelets are advertised as being waterproof and for the most part they are. However, most children have an uncanny ability to quickly and efficiently foil just about any waterproofing system. Therefore I would suggest laminating the medical information card before slipping it into the bracelet. 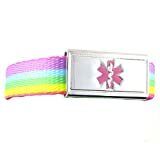 These medical alert wristbands for girls offer all of the same great features and durable construction of the boy’s wristbands above. The only real difference is that the variety of bright colors says fashion statement, rather than the life-saving medical device. These stylish wristbands are sure to appeal even the most fashion conscious. 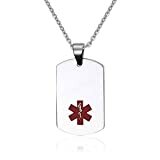 I am sure that if you think about it, you know at least one friend, or family member, who suffers a condition that medical personnel should be aware of in the case of an emergency. 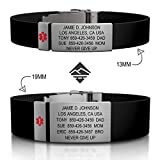 Traditional stainless steel medical alert bracelets are available in blank engravable styles or pre-engraved for a variety of medical conditions. Stainless steel is hypo-allergenic and durable. Any jeweler can easily adjust these bracelets for size as needed. This unobtrusive, stylish jewelry may appeal to fashion-conscious teens and tweens. 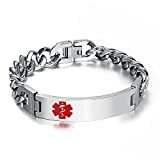 VNOX (Free Engraving) Stainless Steel Medical Alert ID Bangle Bracelet,Silver,7.4"
Free Engraving-Unisex Stainless Steel Medical Alert ID Stretch Bracelet for Men and Women, 7.6"
VNOX Free Engraving Customized 12mm Stainless Steel Stretch Bracelet,Silver,6.6"-7.3"
Silicone medical alert bracelets come in a variety of colors kids love. They are affordable, durable and lightweight. Kids will love them because they look just like the popular rubber bracelets everybody’s wearing. Parents love them because they quickly convey important medical information should it be needed. 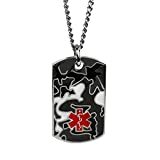 If you child is not too keen on wearing other more obvious medical alert jewelry, dog tags offer another medical alert option. 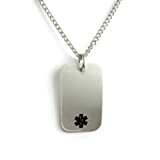 Dog tags are also available in a variety of colors and for some conditions. 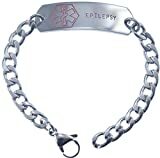 Do You Have A Friend Or Loved One Who Should Wear A Medical Alert Bracelet? Medical alert bracelets save kids lives. I would love to see a bracelet on the wrist of every child who needs one. You can help with this mission by passing this page along to somebody you know who needs to hear this message. Maybe you would care to share with other readers how a medical alert bracelet has made a difference in your life.